What do nurses do? Find out as friends from St. Anthony School of Nursing lead you through their day! 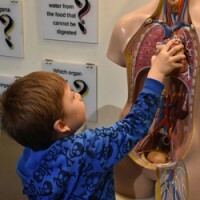 Take vital signs, use a stethoscope, check X-rays, and maneuver through the digestion obstacle course. Complete your nursing chart, bling your badge, and get pinned! Included with Museum admission. Sponsored in part by OSF College of Nursing.